Recent editions of Behind the Headlines have mentioned us visiting various trade events, but without actually saying what we've seen that looks promising for the coming season. So, now we'll put that right, starting this week with some of the products we've noticed. Just lately, there’s been a lot of hysteria whipped up around the subject of chemicals in the garden. People are confusing the ideas of “organic” and “chemicals” and coming to the conclusion that you can’t use any chemicals at all if you want to be organic. The end result is a lot of disillusioned gardeners with failed crops and poor flowers. In fact, German company Neudorff have worked very hard to have almost their entire range of products certified as safe for organic use. They can do this because their products are no longer based on the nasty chemicals of old, but natural plant and mineral extracts, which mean they are safe to use and the crop won’t be tainted. Their Superfast and Long-lasting Weedkiller is the only product that will kill off mare’s tail without the need to damage the plant first to break through the tough, waxy outer coating. The AeroGarden from Miracle-Gro is a hydroponic system with LED lights. Now, whenever something like this is mentioned, people immediately snigger and ask if it’s for growing cannabis - as if that’s the only plant you can grow hydroponically. The fact is, growers have been producing crops like tomatoes, peppers and cucumbers without soil for decades. Small systems like this aren’t new, but this one is very easy to use and would be ideal for anyone who wants to grow fresh produce, but has very little natural light in their home. It’s sturdy, comes complete with pods containing the seeds and has full, clear instructions. You can raise the lights as the plants grow and the balance of colours in the LEDs mean that the plants will cope without natural light. The kit isn’t cheap, ranging from £70 for a 3-pod system to £270 for the 9-pod version. You have to buy replacement pods (although you can use your own seed), but it gives everyone the chance to have fresh home-grown herbs, tomatoes or peppers to harvest. Mowing the lawn is getting easier and easier with the new generation of mowers. Many are battery-powered, so no more dragging the electric cable along with you only to find out it just won’t quite reach the far end. Battery run-time is increasing to the point where you can cut a medium-sized lawn in one go and charge-time is getting quicker. The batteries are often interchangeable with other equipment, too, which saves space in the shed and makes charging easier. If you’d rather have the time to yourself, there are a number of robotic mowers that will do the job for you. You can choose the size to suit your garden, program it and let it do its thing. It will even out itself away in the docking station when it finishes. The really clever ones can be controlled by an app on your phone or linked to the internet, where they can respond to inclement weather forecasts and stop work. They have moisture sensors and learn weather patterns to determine height and frequency of cut, and the grass clippings are so fine, they are returned to the surface to act as a mulch and nourish the roots. Lots of companies produce tools for the garden and we could devote an entire feature to them, but for now we’ll concentrate on what's new. Tools for children have been around for years, but tend to be made of bright, colourful plastic. Now, Kent & Stowe have introduced two new ranges of scaled-down metal tools that will look the same as Mum and Dad's (or Nanna and Grandpa's). The Kids range is ideal for 4-7 year-olds and will be available in May. Made with ash wood handles, safely-rounded carbon steel heads and with a 10-year guarantee they are perfect for budding gardeners, but must be used with adult supervision. The Garden Life range of lightweight tools is up to 40% lighter than conventional tools and is also smaller in size. 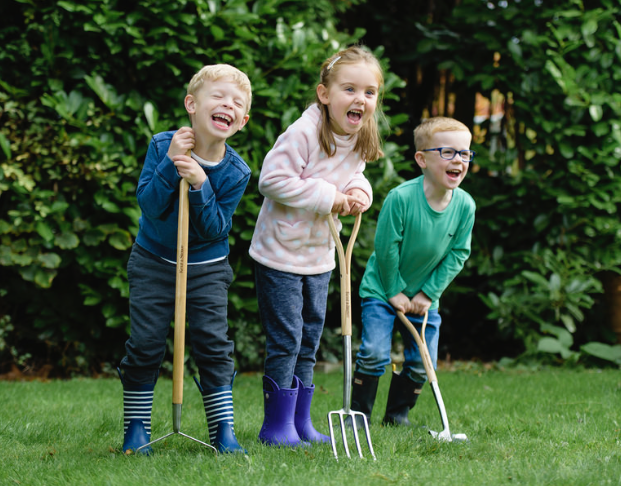 These tools are ideal for children of 6+, but also anyone who finds full-size tools too large or heavy to use easily, for working in a small space or raised bed and for anyone with restricted movement. These tools have ash wood handles, stainless steel heads and come with a 15 year guarantee. You might not think there are many places left for watering equipment to go, but the companies are constantly trying to make life easier with easy-to-coil hoses, timers and automatic delivery systems. Gardena have now introduced their City Gardening range for anyone who gardens in a confined space. This includes a new Balcony Box at £29.99, which contains basic tools in a waterproof box (that doubles as a dustpan), a Terrace Spiral Hose at £29.99 and a new Terrace Hose Box at £64.99. There are lots more products for this spring, this is just a taster. Make sure you check out your local garden centre to have a look.